We’ve all heard the phrase “as busy as a bee” but why do we think of bees as busy? As an employee, one would hope to have the work ethic of the noble honey bee; always on time, always on task, and always a team player. There is however, a drawback to being a bee: expendability. When something happens to one bee in the hive, nobody cares. There are thousands more just like her. There is a bee that is not expendable: She’s called the queen. If something happens to the queen, everybody cares. She does something vital for the organization and not everyone can do what she does. 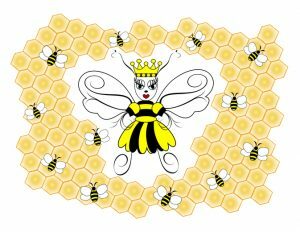 So how does an ordinary worker bee become a queen bee? It’s called Royal Jelly. An ordinary bee is given royal jelly continually during the developmental stage of its life and this special substance changes the bee’s destiny. Royal jelly is the difference between expendable and indispensable in the bee world, and I would submit that the best way to advance is to make yourself indispensable. Do what others are unable or unwilling to do; be useful beyond your scope. Make your own royal jelly and change your destiny. Good workers want to be exceptional but don’t know how to make royal jelly. Here is my recipe: Take one promising career and add all five ingredients in equal parts. Any bee worth its pollen must commit to the craft. Don’t just go through the motions, but make yourself an expert in the field. Peer into the future and see your career in stages, each with a goal that launches you to the next. The problem with keeping your nose to the grindstone is that the grindstone is all you will ever see. See yourself at the next stage and then walk like it, dress like it, even answer your phone like it. Once you set your goal(s) you should have a strategy to reach each one. It’s also good strategy to find someone who has been successful in achieving the same type of goal and glean from their wisdom. Don’t be afraid to self-promote. This doesn’t mean go around bragging all day. Find your strengths and accentuate them. If there is an opportunity to serve the company with your strengths, even if it is outside of your duties, take the opportunity to shine. Learn to embrace change. Change will be a constant in any industry and many of your fellow co-workers will not always handle it well. This is the perfect opportunity to lean into it and stand out. Don’t just roll with the punches, but float like a butterfly and … well you know the rest. Mix in all of these ingredients with your career and you will have your own destiny-changing royal jelly. One thing to remember: Royal jelly is not a one shot cure-all. All honey bees get a taste of royal jelly but only the ones destined for greatness get it consistently. If you want to change your destiny, be consistent with your efforts and take royal jelly every day. In no time you will find yourself exactly where you want to bee. Frank Giles is a territory manager with Lanier Parking Solutions. I would add one more and that would be to bring those below you along through coaching and training them to step up into your position. If your higher up believes no one can fill your current position (you are indispensable in your current position, management can’t afford to promote you above that level), however if other members from your team can easily step up with little disruption to the flow, management can justify promoting you. You become indispensable to the company not to the position you currently hold within the company. Great blog Frank! I love your #5, in our industry change is inevitable and we are constantly evolving……..well done. Wish I’d had Frank’s advice 30+ years ago! Hope it also applies to those of us who are over the hill…but still gazing out at the next set of hills stretching before us. Well said. These are truly words of wisdom that will guide the next generation of workers well.